"Real Indian" Running Against Elizabeth Warren Sues City For Telling Him To Stop Calling Her "Fake"
A self-described “real Indian” who is running against Massachusetts Democratic Senator Elizabeth Warren is suing after city officials demanded he take down his signs calling her a “fake Indian.” The independent Senate challenger, Shiva Ayyadurai, filed a federal lawsuit alleging his free speech rights were violated. Infamously described as “Pocahontas” by president Donald Trump, Elizabeth Warren has lied for years about being of Native American heritage to secure jobs, including one as a Harvard law professor. She’s also refused genealogy tests to prove her heritage and Ayyadurai is finally taking her to task for it. According to The Washington Times, since March 17, Ayyadurai’s campaign bus has sported two identical signs picturing himself and a rendition of Warren wearing Indian attire. 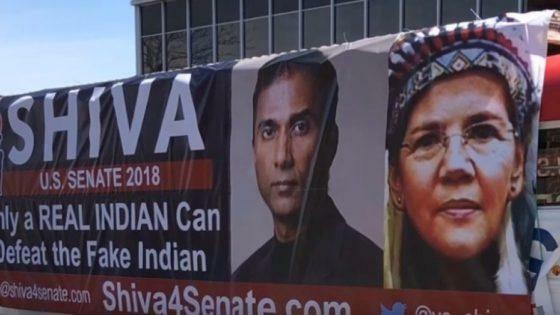 Emblazoned next to the images are the words: “Only a REAL INDIAN Can Defeat the Fake Indian.” The bus has reportedly been stationed in a parking lot in front of an office building owned by Ayyadurai for more than a month, just a mile from Warren’s home. Earlier this month, the Ayyadurai campaign received a notice from Cambridge building inspector Branden Vigneault that the signs lacked the appropriate “approvals and permits,” according to local reports and the Ayyadurai campaign. Vigneault threatened fines of $300 per day plus additional legal penalties if the signs remain in place, according to Ayyadurai. But he’s fighting back. “We will not remove the slogan from our bus,” Ayyadurai toldThe Washington Times. “We will defend the First Amendment, and we will fight this egregious attack on the First Amendment, at any cost.” Ayyadurai’s campaign also said that the building code doesn’t apply to the signs because they’re on a bus, not a structure. Warren has faked being of Native American heritage for a long time, and even Cherokee genealogists claim she’s lying and casts doubts on her story of her parent’s elopement. Of course, Ayyadurai’s campaign has problems as well, such as his long-standing claim that he invented email. Ayyadurai supposedly faces “long odds” at beating Warren.